To get on the waiting list, contact the Community Gardens Program at community.gardens@sanjoseca.gov or 408-793-4165. The Guadalupe Community Garden is the newest addition to the City of San José’s Community Gardens Program. 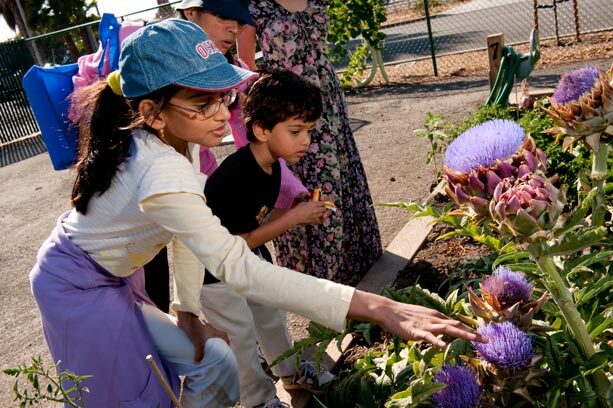 As the first community garden in California to be irrigated with recycled water, the garden addresses the Mayor’s Green Vision goal to recycle or reuse 100% of San Jose’s wastewater, and has gained renown as a demonstration site for environmentally-friendly gardening. The City of San Jose, South Bay Water Recycling, and the Guadalupe River Park Conservancy collaborated to create the Guadalupe Community Garden. One of the plots, planted and maintained by the Santa Clara County Master Gardeners, is used for demonstration, education, and research. Gardeners share compost bins, a tool shed with tools specially labeled for use with recycled water, and a sink for washing produce. A shade structure, picnic tables, and barbecues also make it an optimal site to enjoy the gardeners’ hard work. Public restrooms are nearby in Columbus Park.